For households with little ones and pets, the North States Superyard Metal 3 in 1 is the perfect combination of portable play yard and safety barrier. Constructed with a strong powder-coated metal, the gate can be used to create an enclosed recreation area or it can be set-up as a barrier to block off potentially unsafe areas. Suitable for indoor use, the durable gate is easily set-up in under a minute. Requires: A drill and screwdriver are needed for using the wall-mounting hardware. Warranty: To ensure 100% satisfaction with your purchase, all North States products come with a one year warranty against manufacturer’s defect. Who: Families, babysitters, and pet owners. What: Providing a portable play area for babies, toddlers and small pets. Where: The living room and the playroom. Whether you need a temporary play space for your children or small pets or a reliable barricade for potentially unsafe areas such as fireplaces and stairs, the Metal 3 in 1 Superyard is up to the task. This play yard’s sturdy structure allows you to rely on it as a safe space for both infants and small pets, so you can multitask or relax while they play. For added security, the play yard’s one swinging walk-thru panel is built with a child-proof double-locking system. This proprietary safety feature allows you to easily enter and exit the play yard while keeping you assured that your little one can’t escape without your assistance. Unique for its sheer versatility, this play yard includes six metal panels that can be set up in a wide variety of configurations. Weighing 43 pounds, the structure is solid enough that it won’t tip or lean and lightweight enough to be moved from room to room. Set it on carpet, tile, or even a hardwood floor — it includes rubber pads to prevent scratching. Capable as an enclosed gate or a barricade, its 30-inch high panels can be connected to create an ample 10 square feet of space, or they can be put together as a barrier using the included mounting hardware to extend the width up to 144 inches. If you’d like to extend the gate’s overall diameter, consider purchasing a two-panel extension kit (sold separately), which increases the play space to 19 square feet. Setting up the Metal 3 in 1 Superyard is hassle free. The six interlocking panels are pre-connected–simply pull the panels out of box, unfold and connect them together, and the Superyard is ready for use. To put away, simply disconnect one panel, fold together, and store. The Superyard is so easy you can set it up and take it down in under a minute. The hassle-free panels also give you quick and convenient access to your child or pet. For example, if you want to reconfigure the panels to block off different areas at the same time, you can easily do so. Thanks to the flexibility of the Superyard’s design, you can use a few panels to create an enclosure around the stove while dinner’s cooking, then use another panel and the included wall-mounting hardware to create a small-scale barrier around a staircase. To ensure 100% satisfaction with your purchase, all North States products come with a one year warranty against manufacturer’s defect. Located in Blaine, Minnesota, North States Industries offers versatile and economical gates and enclosures in the juvenile and pet categories. All of the company’s products are certified by the Juvenile Products Manufacturers Association for safety, and are engineered to provide the highest quality, durability and ease of use. North States Metal 3 in 1 Superyard with six metal panels, hardware, and assembly instructions. The child-proof double-locking system keeps your children safe. View larger. Q:What is the width of one panel? Individually, each panel from connector to connector, is 25 3/4″. But when you connect panels, the connector pieces of 1 panel overlap the connector pieces of the connecting panel and you lose width, so 2 connected panels is 50″, 3 connected panels measure 74.5″. Q:Does anyone know where I can purchase additional wall mounting hardware for this unit? I don’t see it on Amazon or the North Gates website. Thanks! Q:how do you use with one extension? The gates are easy to combine. I own four gates. I used almost three sets to make a giant play pen for children. It has two gates and is very solid when put together as an enclosure. I then have two smaller sections for large entry areas of the home. Sections each have a twisting lock that are easy to loosen and tighten. Once loosened, just take a section and put it on another unit. They are very easy to separate or combine. Q:Can you remove one panel and just use five panels? Can the gate be the last panel on the end or does it have to be the 2nd or 3rd panel? Q:Debating between this & Kidco Auto Close gate. Anybody have experience with both & able to tell me main differences in features, ease of use, etc.? I have the North States configure gate and a Kidco auto close gate (for standard doorway openings). I love the auto close feature of the Kidco gate and the fact that the door swings both ways. The North States gate does not have an auto close feature and only opens in one direction. The Kidco gate is opened by pulling back on a latch and then lifting up the door; very easy to do with either hand. The North States gate is opened by pushing a button and then lifting up the door. Also easy to do with either hand. Both gates are sturdy. I am using my Kidco gate tension mounted in a standard doorway and it won’t budge. I have the North States super yard gate set up so that it is blocking a wide entryway between my living and dining rooms. It is not tension mounted but my husband set it up so that it has four 90 degree angles in sort of a U shape. Imagine 90 degree angles at the top and the bottom of the U, if that makes sense. It is amazingly sturdy even like this. I initially bought a Kidco configure gate but after bringing it home I realized that I actually needed to buy 2 to make it a super yard like this North States gate, for a significantly higher cost. So I returned the Kidco gate and bought the North States configure gate on Amazon and am very happy with my purchase. If price is not an issue, then I recommend the Kidco gate simply because of the auto close feature, but you can’t go wrong with either one. Q:Can you connect two together? Yes, I did so. It works well. Need to arrange in a slight zigzag for stability. Supervise your kids, of course, when they’re in it. 6 pieces as shown in picture at 24 1/4″ long. Q:Is it safe to use as a long, straight barrier, or do you need to angle it for stability? Thoughts? Did you end up getting the gate? I have a 9.5 ft. opening (straight across)… just wondering if you found one that works! Thanks! Q:Can this gate be used in a straight line, wall to wall? Would the child be able to push it over in the middle or is it sturdy enough? Q:If I were to put this around my fireplace in the corner and not attach it to the wall, how well will it hold? I have this around our stove and it works great. We have dogs and a 15 month old. Sometimes our son will move it away from the wall but other than that it stays in place very well. It’s pretty heavy duty. Q:Anyone have an option about this model compared to the plastic for use as a playyard for a baby/toddler? Q:Is it sturdy to use on top of stairs? Would it hold the baby weight in case my daughter leans on it? Thanks in advance! Yes, it’s sturdy. My kids push on it and my son (after many months and much practice) has learned to climb over it, but the only issue we’ve had is that it’s starting to come out of the wall a little. It takes a lot of abuse but it’s a good, strong gate. Q:Would I be able to install this on a wall with a baseboard? Yes! The part that attaches to the wall can be placed at any vertical point. Q:Size of gaps between the bars, particularly on either side of the gate? Could a puppy squeeze thru? 2.25 inches gap…newborn puppy….but they usually have to be able to stand and climb out of their litter box first and not coordinated yet. Q:Can you buy two of these 6-panel gates to create one, big, frestanding 12-panel enclosure? Will it fall over? Sure you can. It is very stable. Q:Does anyone know how to disconnect the panels? I’m trying to shrink the size by removing a panel, but can’t figure out how to do it? The rods connecting pieces together have a big block like cylindrical piece that locks them in place. If you unscrew these completely the panel can be removed. Mine came attached, except for the gate and all you do it loosen a screw and snap the end into each other. Very easy. Q:If you have to keep it in a straight line, can you use it for a custom-sized opening? Does it have any ability to slide/expand panels for a custom length? Q:Is this heavy enough to keep the child from moving/knocking it down? Q:How many inches wide is each panel? Each panel is 2 ft. Allow 2 inches more on each side for secure wall installations. Swing open gate (is within a 2 ft. panel.) is only 1 ft. 2 in wide. Narrow, but ok for me. ( F.Y.I.) I’m 170 lbs, so I go thru sideways. I have a 12 footer strait span. Quality is excellent. It should work for your space. It divides rooms well and u can configure it into what ever line u need to divide the room. It is sturdy since u actually drill it into the wall on each side. If u push it it will move a bit so I would suggest putting it on the lower level, up against the step. Or if u need it on the upper level leave some room so the baby can’t push it over the step creating a space to get stuck in. Q:Is this item suitable for a 10 month old baby? Or should they be older? Absolutely perfect for babies and toddlers. Very sturdy. The gate is fabulous. The fencing is sturdy and has some weight to it so if they are pulling up, it will not tip over. Just one will not be very spacious though, you might want two. It also comes with attachments so you cam hook it to the walls and enclose a corner area if you wish. Q:Does it have to be mounted to a wall with screws or other hardware? Hardware is provided for wall mounting, but it stays up without it. We have ours standing next to some furniture and our little one is not strong enough to push it yet. Q:Once mounted to the wall, can the fence be removed when not needed – leaving the brackets on the wall (then attached back onto the wall mounts later)? Yes. You just unscrew the “pole” that attaches the gate to the brackets. It would be fairly easy. Q:Spacing between bars? Can someone provide the distance between the bars? FYI, I was wondering the same thing about the spacing between the bars. 3.5″, as another poster said, seemed quite large to me, so I called the company directly. They said the space between the bars is 2.25″ which is a far cry from 3.5″! I told the representative that someone on Amazon had stated it was 3.5″ and she said absolutely not — they need to comply with JPMA Standards (Juvenile Product Standards), which states it has to be less than 3″ and they were far below that. I always found it was best to contact the company directly, in my experience. Hope that’s helpful! Q:Can you purchase additional gates that fit this superyard, or just additional panels? I have only seen additional panels, not gates. Q:Is this gate relatively easy to fold and move? I need something that I can use both upstairs and downstairs at different times during the day. Q:My gate latch on this is worn out. Is there any way I can purchase just the one part gate section? I would contact the maker to see if they will sell the gate individually or if it can be repaired. North States Industries Consumer Services phone number is 763-486-1756. As you see the 6 sided figure, each individual piece…joint to joint…is 2 feet. Based on that measurement, you would need 5 individual pieces for each of your 3 sides. The basic hexagonal super yard is 6 individual pieces or, as I remember, either 2 sections of 3 individual pieces, or 3 sections of 2….I think it’s 2 of 3…it’s been about 6 months since I put it together. You can also buy the extension pieces which are sections of 2-2 foot individual pieces. Using your desired 10′x10′ parameter, you would need 15 individual pieces…odd number, not going to work…12′x12′ you would need 6-6-6=18…8′x8′ you would need 4-4-4=12 individual pieces [6 sections of 2]. The joints between individual pieces can be loosened or tightened as needed allowing flexibility for forming the angles needed for your space. Hope this gives you some idea of how to play with this system so that you can adapt it to your needs. Great product! Loads of possibilities. Q:I bought the wood one but its a bit chunky and clunky. is the metal one thinner and lower profile? Q:Which is better between the wood or metal? Q:If I bought two sets of this product, could I connect them and use the result as one really long barrier or a really large enclosure? Q:Are the connectors metal or plastic? Will it be able to move out of place once screwed in? I have the Regalo gate and my child can bend it a lot. They are plastic exterior connectors, but they each have a twist lock mechanism so once it is in the place you want they do not move. My daughter is constantly hanging and shaking the gate and it does not move. It should be fine as long as it’s mounted and locked correctly. Q:Does it come with wall mounting hardware? Q:Is this color taupe? Trying to figure out which color extension will match? I’m not great with colors, but I would say this is more of a beige color. Q:Can I attach multiple sets of extensions? For example, can I attach 4 extra panels (2 sets of extensions)? Yes you can. I attached two playyards together,so I could make a largerarea to play in. Q:I need a baby gate for a 15.5 foot opening. Would this gate work? How many feet total is it? & how many extensions would I need? Q:Can sections be pressure mounted between walls? I know about the hardware option to connect to studs.. but sometimes that’s all I need. Q:If I wanted to use this around the bottom of my stairs, does it have to be screwed into the wall or is there a way to attach it by tension? I don’t think there is a tension option. I’m not 100% sure. It is a very sturdy gate however. The weight and construction is better than the baby gates I own. I bought the extra panels, and use that square to block off areas. If I had to buy more baby gates, I’d stick with the same brand. If I was looking to block stairs, I’d zip tie this to my stairs. I hope this is at least a little bit helpful. 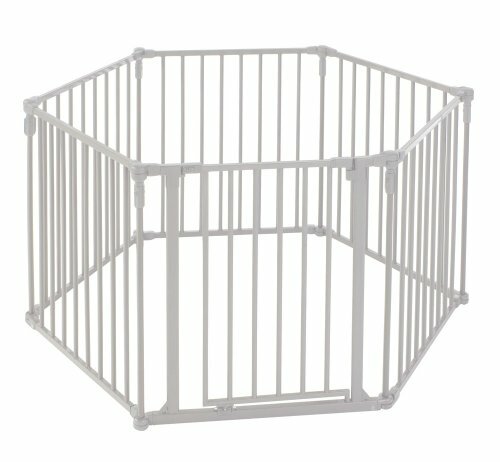 Q:are the wall mounts included in this north states superyard 3 in 1 metal gate? Q:Do you have to use hardware to mount it or can it be pressure mounted from wall to wall? Q:What is the color of the play yard? I’d say its closer to a very light grey. Q:The extension pack is listed as taupe in color, but nothing seems to say the color of this full set. Taupe? Or, white as it looks in the photos? Q:Can you remove panels to make it shorter? Q:does it come with the hardware to attach to the wall like it shows in the photo? Q:is this product includes wall-mount part? Yes, two small parts. I did not need to install this so can’t tell you how sturdy/durable it is. Q:I want to use this to separate my kitchen from living room. Do you think it will work if I attach it both the ends? yes, it is very versatile and can be used may ways. We used it to block off a pool from the patio…one long stretch of 144″. Worked like a charm! Q:Would this fit at the base of a Christmas tree? Q:I have a 60 pound bulldog. I am wondering how sturdy the metal is and can a dog push it down if it is mounted to the wall on each end? My dog is 52 pounds. I use it as pictured and have found it very sturdy, and it stays in place very well. It’s a good quality product. Each section locks which helps it to keep its shape, even if used as an extended gate it will keep its shape once locked in place. You pose a good question unfortunately I can’t answer that question (sorry). You could try it while you’re at home, see what happens. It’s easy to fold up and unfold if you would need to send it back. I hope this helps some. Good luck! Q:Can someone please post the exact width of the gate opening? So far the answers have ranged from 13″ to 20″. Can it be that the gate varies in width? Q:Do the hardware mounts for this gate need to be screwed into the baseboards? No, it is free standing. Works great! Q:Has anyone used this as a play yard (not as a fence) for young children? Does it stand up well? Does it get tipped over easily? I haven’t used it in a complete circle, but I do use it in a half circle. The open side is against the wall. We find it very sturdy. We have the plastic colored one as well and this one is much better. It’s very heavy though, so it’s not good for traveling much. The plastic one is better for that. Q:You say the gate itself is an off white. But for the extension is says it is a taupe color. Why is this? As I of course want it to be the same color. Received same color…don’t think this product comes in any other. Q:Can I spray paint it a different color? You should be able to with a kid safe paint. Q:Would you be able to cut a hole in one of the panels if I had it up next to my doggie door which is about 7″ x 11″? They are metal tubes… They are attached to the top rail but I wouldn’t think it would be secure OR safe, exposed metal edges. Q:exact length from end to end is? Q:I have two 5 month old mutts @ 40lbs each. They are now able to jump out of this pen. Anyone know of covers that will secure to the top to enclose it? A net or a tarp with zip ties would be the only thing light enough that I would guess would work. Anything else like metal or wood would end up extremely heavy and sag in the middle. Q:what is the distance between the bars? I have a small dog and I want to make sure he can’t get through. If your asking about a small dog being safe in this fence. The bars are less then 4″ apart, so depending the size of your dog it should be safe. Q:What is the spacing between each rail? I want to make sure my small dog can’t squeeze between them. The gap is 2 1/4 in. It makes a 3ft 7in. octagon shape around. It sits 2ft. 5in. high. My 50lb lab still uses it to sleep, eventhough he can jump it. I love using it as a doggie pin. Q:Can this be used with two large dogs? 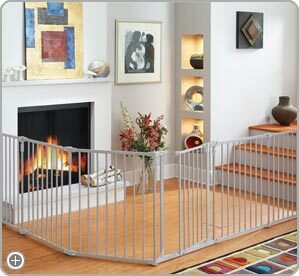 I want to put this gate around our back door w/dog door so that they can’t get to the rest of the house. You would need two gates. One gate would be way too small for two large dogs. Two gates would be comfortable for a couple hours but they wouldn’t have a ton of room. Q:can an older cat squeeze thur these bars? I have a medium sized cat that is about 5 years old, I have never seen her try to squeeze through the bars and don’t really think that would be possible, but she easily jumps onto the top rail and then down inside. Q:does the optional two gate extension come with this gate or does it need to be bought to extend it to 19 ft? The two panel extension us sold separately. There is 2 1/2 inches between the each bar. Q:Does it come with the mentioned wall mounting hardware? Q:Could you use this in a strait line to divide a room that is 12 feet wide? You can use it as a straight gate. We have it acroos the opening on our porch steps and it’s straight across and then we had to angle the rest of it. You can click on the “specifications” for the product on Amazon (it shows 36.2 lb). Q:I am looking for a lightweight, portable pen. Do all the panels fold up easily for storage and carrying? What is the total weight? They do all adjust and fold but it’s not made to be portable. They won’t lay flat and it’s VERY heavy! I wouldn’t recommend it for travel and if I was going to store is take each panel apart! Q:If I buy 2 of these sets, could I separate the second and make either an 8- or 10-panel enclosure? Q:How far away from the wall can the gate be and still have the mounting hardware work? We have 3 inch deep baseboards on every wall. I don’t see any restriction about how far the gate can be .. mine came assembled I mean panels assembled so I used that way. I used in straight form like a fence to split my living room. Hope it helps ..
Q:does it have a suction thing in each corner for the wood or concrete floors?? No, it did not come with suction cups. Q:Product height – the description ad say 30″ high, the spec portion shows 33 x 28. Can you clarify? Q:Does the metal get hot from a woodburner? I have no clue. I don’t have a woodburner but I know it doesn’t get that hot outside in the sun. Q:Is the “powder” coating on the metal lead-free? Also, what type of metal is used? Q:Can this be easily folded and stored when not in use? I am a grandmother and keep my grandbaby once a week and would like to store when not used. I think so…although when folded, if you have all the pieces hooked together – it may be a bit heavy for you to move – but I think it folds fairly easily. Q:I would like to use this as a child guard on three sides of my pellet stove which is kitty corner, attaching it to the wall on each side. Has anyone used it this way? Thanks. We used it to section off a ferret cage that the dogs wouldn’t leave along. We used long nails hammered halfway into the wall and than wrapped around the gate and it worked just fine. You would have to find a way to secure it to keep children from just pushing it forward, but other than that it should work great for you! Yes, we use 4 of the 6 to make a small square. for 49″x41″ you’d probably need more than 4, but you can definitely align them at right angles. Q:How wide is the walk through gate? Q:What color is it? I have one light grey color and need to buy second set. I want to be sure that it will match. The color is taupe. They should all be the same color. Q:Can you remove one or two panels from one fence, and connect to another fence to make it longer? Yes but because of the fittings you must connect (or remove) 2 panels if you want to make it reconnect with its self. If you are using it as a wall or fence you can remove or add as many as you like. Q:what is the color of the superyard? Q:what is the color of this product? Q:Can the baby lift it off the ground and get her feet / hands trapped under the gate, if the gate is not attached to the wall (i.e. free standing)? I wouldn’t think so but I guess anything is possible – I think the leverage you would need to lift it comes from above and a baby wouldn’t have that leverage or strength in my opinion. Q:Can this gate be placed at the top of a staircase? No, the sections are not wide enough, it does fold up but nothing to anchor a section or two to. Q:Replacement / extra parts?? I am wondering if anyone knows where to buy extra wall mounting parts or an extra gate section? Q:When used as a play yard, does it slide on wood floors? In other words, can a baby/toddler push it? Qhwn used as a play yard, can an infant/toddler push it on wood floors? If your child is strong enough to push it (it’s pretty heavy), yes it will slide on wood floors. I imagine you could get some sort of rubber pads that would help prevent it from moving. Q:Are the gates white or grey? What color is the North States superyard? “Taupe,” which is a very light grey. I was disappointed by that at first, but it is such a light grey that it doesn’t look bad with neutral furniture. The company/Amazon need to change the description to clarify that it’s not white. Q:Doors: Can each section be a door? There are only enough pieces to attach to one doorway and there is only one swinging gate. Not sure if you can buy extra pieces… I am on the hunt for more mounting pieces because I am currently using the gate in one doorway, but want a “regular” section in another doorway. Basically, the way it comes, you can have it as an enclosed play yard or have some/all sections stretched out to block a wide opening and attached only at the ends. Q:How wide is each panel? Can someone tell me how many inches wide each panel is? Q:Trouble putting together: Any suggestions? I believe my husband popped off the “cap” piece at the bottom that the pole wouldn’t fit in to when we tried to close off the play yard. He just used a screwdriver to pop it off and then the pole fit in no problem. It didn’t damage the popped off piece either and we still have it in case we need it. Hope this helps!! Q:30″? Is the description correct in saying this gate is 30″ high? Correct, 30″ is the height, and one must be careful not have “large toys” in the area, because a child can stand on the toy and be quite taller. Q:Will a toddler be able to knock it over? Q:How easy is the latch to operate by a 5 year old? I have a kindergartner that needs to get to the bathroom through the gate. We don’t have a five-year old, ours is about 16 months, but I believe it would be very difficult. There is button on top of the frame near the gate. The button has a fairly stiff spring. You have to push down on the button and then lift up on the gate and swing it out to open. Having said that, kids can surprise you. Q:Can this gate easily be detached from the wall and temporarily configured as a playyard without removing the wall-mounted hardware? I wasn’t sure, so I just tried it myself. It comes off from the wall attachments in the exact opposite way that you attach them. The ease of this, I think, will depend on how tightly you mount it in the first place. Bottom line is it can be done without removing wall mounted hardware. I don’t think I would do it on a daily basis, though. Q:Can I buy one more extra gate? As far as I know you can buy an addional gate. Just search for a single gate to add on Amazon. Q:I want to use this at the bottom of a spiral staircase. Do you think this would work? I wouldnt recommend this at the bottom of a stair case….unless u where to attach to the outside of the stairs and wrap around to the other side. Q:how to reposition the gate panel? Anyone? Did you ever figure it out? We have the same problem. Q:can you reverse it and make the gate open in instead of out? The joints are limited to about 35 degrees each and the sections go together in a keyed fashion that limits their direction, so you couldn’t reverse a single section or have it connect “inside out.” So simply, no, I do not see how it is possible.